You are here: Home / Buzz / Does Death Wish Coffee Live Up to Its Claims? Journalists do crazy things to chase a story. Taste-testing Death Wish Coffee isn’t as harrowing as being waterboarded – which Christopher Hitchens did in 2008. But for a caffeine-sissy like me, the prospect of hyper-caffeination was nearly as unnerving. Fortunately, my actual experience was far more pleasant than Hitch’s (which he details in Vanity Fair). His was torture, mine was…well, I’ll get to that later. It’s not my fault I’m a caffeine wuss; I blame it on my genes. A mug of half-caff is my morning max. 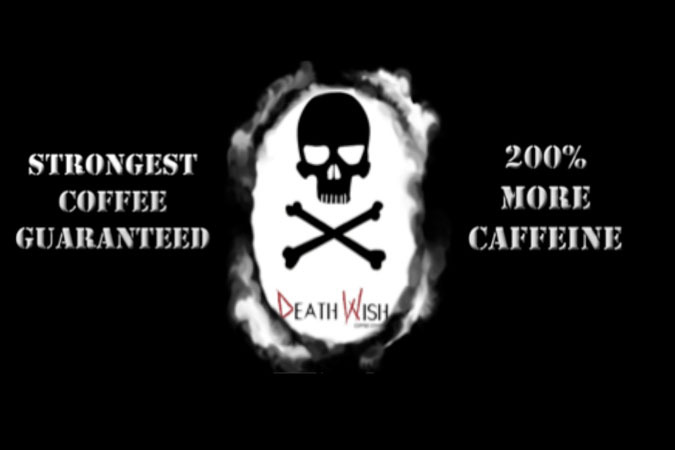 So when Death Wish Coffee claimed it was 200 times more caffeinated than regular coffee, I realized – reluctantly – that to write about it, I would have to try it. Reporters do what we gotta do. Words matter. If something is 200 percent MORE caffeinated, it’s actually three times as caffeinated. If it’s 200 percent AS caffeinated, it contains twice the caffeine. I’m not sure how to interpret “close to 200% more caffeine.” Maybe this is nitpicking, but when it comes to caffeine, three cups of coffee deliver far more punch than two cups. And Death Wish’s pitch is all about the caffeine. Q: I’ve seen media stories saying Death Wish Coffee is 200 percent more caffeinated than regular coffee. Is this an accurate statement? A: Yes, if brewed correctly. Q: Your website also says: “200 percent more caffeine” which seems confusing. Do you mean 200 percent as caffeinated, not 200 percent more caffeinated [than regular coffee]? A: Double the amount of regular coffee. When brewed to our specs. Okay. So I got my answer, but not without a slight disconnect. It’s twice as caffeinated, not three times as caffeinated – when brewed “correctly” (the company recommends a generous 2-1/2 tablespoons ground coffee per 6-ounce cup). Death Wish has a lot going for it as a product. I think “double-the-caffeine” is a terrific marketing angle. But when the word “more” is inserted after 200 percent, the claim ripples with Stephen Colbert-style truthiness – people believe it’s three times as caffeinated, even if it’s not. From Good Morning America to NPR, media outlets have blindly repeated this claim. But does this language-thingy matter? Not to extreme caffeine-junkies. Death Wish has plenty of Facebook followers and 17,800 Likes. Clearly, if you’re into caffeine from coffee (as opposed to energy drinks), this is the brew for you. 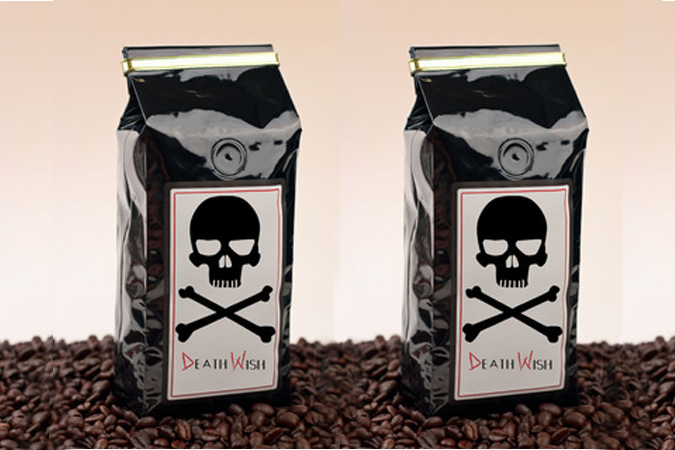 So what makes Death Wish Coffee more caffeine-rich than other coffees? “Different types of beans and brew methods have different levels of caffeine. Most can be found with a little research,” says Brown; he’s a barista who’s been tinkering with caffeine levels for the past five years. Coffee experts would agree. For instance, dark roasting destroys more caffeine than lighter roasting. Fine grinds and longer steeping put more caffeine in the cup. Most importantly, caffeine varies according to plant species. Coffea robusta is more caffeinated than her sister bean, Coffea arabica. Robusta also leans toward strong and bitter in flavor, and is typically valued in espresso blends. Arabica is the choice of premium coffee roasters, who find it smoother, more refined. Robusta is hardier to grow, less expensive, and often mixed with arabica to help control costs. So what beans does Death Wish contain? A passage on their website clearly and accurately details the nuances of robusta, arabica, and roasting levels. I read it several times before realizing: it never specifies what types of beans Death Wish actually uses. Q. Are you using robusta or arabicas? Your media kit/website is unclear on which bean you’re actually using. Brown’s position is understandable; trade secrets are a brand’s lifeblood. So consumers will have to be satisfied with his statement that ” …we went on a mission to find a coffee that is not only dark, rich, bold and flavorful but also has high caffeine content. All while being grown organically, fairly traded, and shade grown (saves the land). To boot we found one that is also bird friendly.” Brown adds that his coffee is not genetically modified, contains no artificial ingredients, and is organic (though not Certified Organic) – all good stuff. Now, to my testing. Brown shipped me a bag of ground Death Wish Coffee. How does Death Wish Coffee taste? Powerful, but not in a bad way. What a relief! I was afraid it would be so bitter I’d prefer waterboarding, but it was fine. Death Wish didn’t send me to heaven, but it sure wasn’t battery acid from hell either. My Jura-Capresso poured out a stout brew with a thick and lovely layer of crema. One taster in my office said it reminded him of what you’d drink at a business hotel – for executives on the go, go, go. Another taster who leans to milder coffee even enjoyed the robust aroma and taste, but wouldn’t make a habit out of it – adding it was not much different from popular coffees served today. 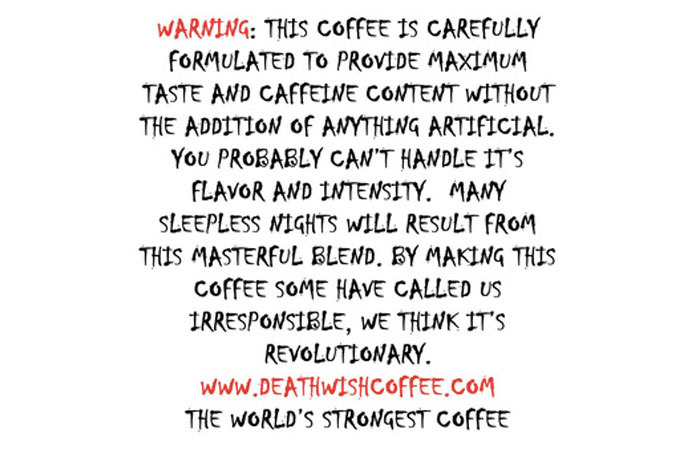 Fans on the Death Wish website praise the flavor, and I can see how it would appeal to many. Taste is in the buds of the beholder. Here’s what I would add: Try it in cooking. Most recipes calling for coffee use too little to inject a noticeable caffeine jolt; but when I added Death Wish to tiramisu and brownies, they seemed to buzz a little bit brighter. You could say they were addictive.